Which focus points on the Nikon D750 support f/8? The Nikon D750 has 11 autofocus points rated up to f/8. Which ones are the f/8 points? 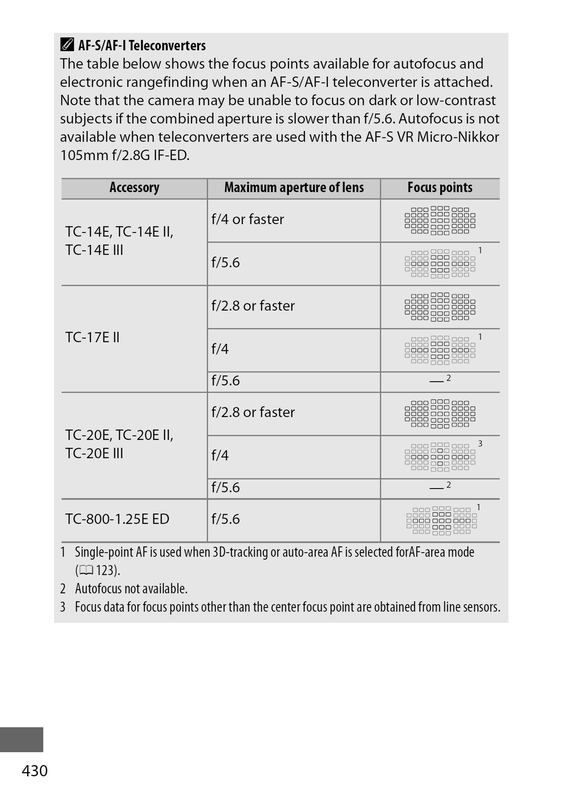 According to Nikon D750 User’s Manual (rev. 03), there are 11 to 15 autofocus points rated up to f/8. On page 430, the manual details which points work with different lens and teleconverter combinations. The 15 points that usually work at f/8 comprise the 3×3 square around the center point, a row of 3 points to the right of the square’s middle right point and a row of 3 points to the left of the square’s middle left point. The 11 points that always work at f/8 are the center point, a row of 4 points to the right of the center point and a row of 4 points to the left of the center point, the point directly above the center point and the point directly below the center point. The TC-14E series of teleconverters lose about 1 stop of light, the TC-17E II loses about 1.5 stops, and the TC-20E series lose about 2 stops. Not the answer you're looking for? Browse other questions tagged nikon autofocus nikon-d750 or ask your own question. What is the advantage of the huge number of AF points? How do you use the different autofocus points on your DSLR? In which situtations are cross-type autofocus points better? Does MC-DC2 release cable work with Nikon D750? Can I use both the built-in flash and the PC adapter on my Nikon D750?